PHILADELPHIA (Embargoed until 12 p.m. EDT, Tuesday, June 26, 2018) – Research presented at the 2018 Annual Meeting of the Society of Nuclear Medicine and Molecular Imaging (SNMMI) demonstrates for the first time the benefit of providing earlier lutetium-177 (177Lu) prostate-specific membrane antigen (PSMA) radioligand therapy to patients with metastatic prostate cancer. Until now, this therapy has only been used in patients with end-stage disease. 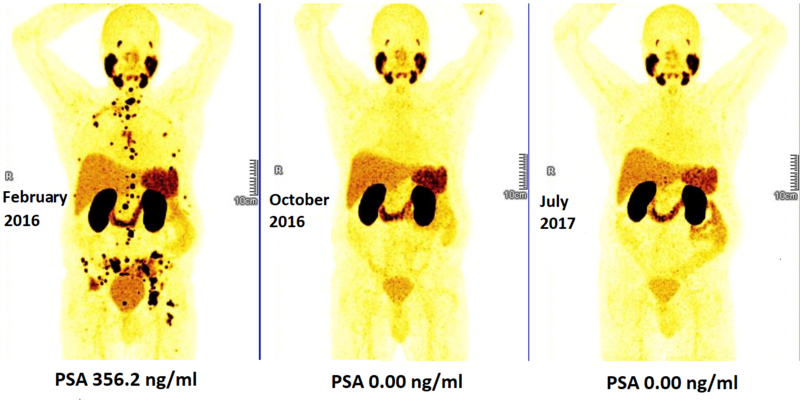 The study included 224 patients with metastatic prostate cancer, who were restaged following diagnosis with gallium-68 (68Ga)-PSMA positron emission tomography/computed tomography (PET/CT)—the diagnostic partner of 177Lu-PSMA radioligand therapy (PRLT); the two form a theranostic nuclear medicine pairing. Theranostics refers to the combination of a predictive biomarker, in this case PSMA, identified through diagnostic imaging using radiolabeled ligands (which lock onto the specific cancer cell receptor/biomarker), with precise therapy targeted on the now-identified cancer cells. The cancer cells are destroyed, while healthy cells are unharmed—minimizing side effects and improving quality of life for patients. The patients were grouped according to previous therapies, which included surgery, chemotherapy and external beam radiation therapy. Serum prostate specific antigen (PSA) levels were monitored before and after therapy with 177Lu PRLT. Study results showed a reduction in PSA level in 70 percent of the patients treated with 177Lu PRLT, and 54 percent had their PSA decline by more than 50 percent. The median overall survival in all patients was 27 months. First-line PRLT was associated with the longest survival (all 18 patients alive at 55 months). Patients previously treated with chemotherapy had a significantly shorter survival (median of 19 months). Survival was also shorter in patients with previous radium-223 (223Ra) treatment (17 months). On the other hand, prior surgical or radiation treatment of the primary tumor had no significant effect on overall survival. Patients demonstrating a PSA decline of more than 50 percent after at least two PRLT cycles, lived significantly longer (38 months). Additional treatment with newer antiandrogen agents Abiraterone or Enzalutamide in combination with 177Lu PRLT also prolonged survival. Abstract 529: “Early initiation of Lu-177 PSMA radioligand therapy prolongs overall survival in metastatic prostate cancer,” Harshad R. Kulkarni, MD; Christiane Schuchardt; Aviral Singh, MD, MSc; Thomas Langbein; and Richard P. Baum, MD, PhD, THERANOSTICS Center for Molecular Radiotherapy and Molecular Imaging, Zentralklinik Bad Berka, Bad Berka, Germany. SNMMI’s 65th Annual Meeting, June 23-26, Philadelphia.